The Marsh San Francisco Presents "A History of World War II"
"The D-Day Invasion to the Fall of Berlin"
The Marsh San Francisco announces the extension of multi award-winning actor/playwright and Theatre Rhinoceros Artistic Director John Fisher’s acclaimed solo show A History of World War II: The D-Day Invasion to the Fall of Berlin.Offering a compendium of facts about WWII from the bungled plot to assassinate Hitler (“A mess! Organized by a bunch of loser bureaucrats!”) to the big secret – how the Russians won the war for us (“They did all the work!”), this lauded production also surveys the best books on the topic, as well as the most attractive generals who fought the battles and the hottest actors who played them in the movies. 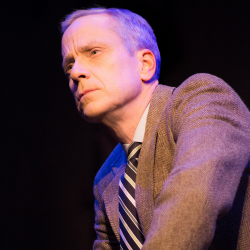 Capturing the Best Actor award from the 2017 United Solo Festival, this highly entertaining work also demonstrates how WWII helped Fisher win boyhood battles with his older brother.